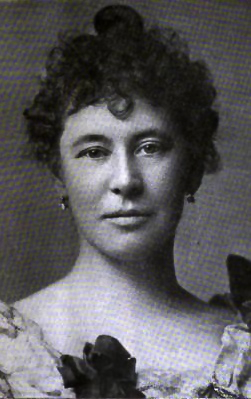 The voice teaching profession is full of colorful characters, and Baroness Katherine Evans von Klenner (1858-1949) does not disappoint, which is made abundantly clear in my previous post which details her foray into spirit communication with the dead. Klenner is also notable for being America's first certified García Method exponent. While there may have been others who were given the nod by Viardot-García and her brother Manuel, Klenner was the first to publicize this fact in a big way, which propelled her into the first rank of singing teachers in America. Klenner studied with Viardot-García with the explicit aim of being a voice teacher—an unusual request since the vast majority of students study with important teachers with stars in their eyes. Of course, to be an exponent of the Garcías, you had to be able to sing, which Klenner did as a dramatic soprano. Here is the first article which introduced Klenner to readers of The Musical Courier, which took something of a shine to her. Miss Evans is a pupil and an authorized and certified teacher of the great Mme. Viardot of Paris. She is a finished exponent of the García Method, of which it is so often been said: It never lost a voice, but it very often found one," and it was as a teacher of this method that she first came to the National Conservatory of Music, where she is now in her fifth year. Desiring to replace a Marchesi teacher by the famous García Method the conservatory wrote Viardot-García, in Paris, asking her recommendation from among her American pupils of one, as a teacher. The reply that Miss Katherine was the one particular pupil so qualified, that Viardot could earnestly commend her, and the engagement of Miss Evans with the conservatory was thus immediately formed. Her reputation has grown with her emphatic success and by the honest work which brings its results, Miss Evans has turned out a relay of artistic pupils whose development is ample testimony to her powers. Her voice is a dramatic soprano of broad, firm caliber and pure and sympathetic quality. but its fullest development was not attained until under Viardot. While especially devoted to oratorio and to German Lieder, Miss Evans controls also a remarkable colorature power. But this is what she claims to be a distinguishing feature of the García Method, and of the García Method only. By it you can sing anything. The same voice which delivers a broad dramatic aria of large phrase and rigorous demands on sustained powers can, by the García Method accomplish flexibly the most brilliant fioriture, and will be equally at home in an oratorio recitative or a Proch variation. Upon this Miss Evans dwells with weighty emphasis. "Anyone," Miss Evans says, "who can express varied emotions in language can also be taught to express them in song. Singing is simply musical language brought about by perseverance and intelligence in the use of the vocal cords according to scientific principals. Personally, Miss Evans is a young woman, tall and prepossessing in appearance, with a manner whole-souled, frank and exceedingly genial and refined. The Musical Courier, November 13, 1895.